I last posted from Spooner in Wisconsin where we enjoyed a nice rest with an extra day because we woke to thunderstorms. Five minutes after Jan paid for a further night, the sun came out. Oh well, too late now. But the following morning, Thursday, we were pretty much packed the evening before and were soon saying a fond goodbye to Margaret, the owner of Green Acres; what a friendly and helpful lady; we had spoken lots about photography and she had given me lots of information on the area and, saying goodbye, I felt I was leaving an old friend behind. It was a lovely ride on US-72 – we would follow this road until we crossed into Michigan. The roads were curved and undulating and edged with National Forest either side. Within the first 3 hours we saw an eagle, deer and fawns and, amazingly a bear! It was ahead of us, close to a curve in the road; initially, Jan thought it was a black car coming around the bend – until it ran up the embankment and disappeared behind a curtain of leaves; it had to be the biggest bear we have seen so far – and a reminder that much of the USA still has plenty of wild animals – even in the midwest. There were some lovely villages – a couple had wineries – but it was a little early in the day and we had many miles to travel. Finally, we crossed into Michigan and began looking out for suitable motels. We came to one tiny town that had a motel sign – but it was closed down. We stopped to fill up with gas and ask if there were any more motels nearby but the people were not all that friendly. Noticing a rack of stickers, I got the feeling this was a very Republican town and outsiders were not welcome. We have seen a lot of anti Obama evidence in the smaller, more religious/ Republican areas. Soon we were close to the water again – in fact this lovely area of sand dunes and grasses is the very northern tip of Lake Michigan. Stopping to go look at the Great Lake, we spotted a couple of bikers who expressed the way we have often felt. And before we knew it – well, 460 miles later – we were back in St Ignace. The UP is very proud of a product very familiar to us Brits – and especially where I live – in Cornwall; the pasty! The town was busy but we did get the last room left back at the out-of-town Cedars Motel – and, too hungry to bother getting back on the bike, we bought some pizza from across the road, ate it, showered and climbed into bed. Next day, more thunderstorms were forecast and we asked if the room was free for Saturday – it wasn’t and, it seemed every other hotel/motel in town was also fully booked. There was nothing special going on, but I guess, this being the last week of July, folk were having one last weekend away before the kids go back to school. So onwards we went – first the Mackinac Bridge to ‘mainland Michigan’ and, darn and blast it, there were road works. The real pain of the road works on this bridge is that it meant we had to ride slowly across grating – quite nerve-wracking (and wobbly) Even worse when a stupid woman nearly rode into us because she was busy sending a text on her phone while driving! Even the geese were not too happy with the weather. We decided to take the western coast of Lake Michigan so we would see some new places – but the rain came down and we passed through lots of small and rich towns – Petoskey and Charlevoix – very pretty but very affluent and crowded. This was the weekend of a big yacht race from Chicago to Mackinac Island, plus lots of towns were having special weekends of one sort or another; so we queued in traffic and we wiped the rain off our visors and continued on until we found a chance to escape the lake area and head inland. It was at around 7pm we finally found a motel – we had passed lots of motels in small, inland towns – but they were nearly all closed down. The one we found catered to dirt bike and ATV riders – three bikes next door were busy revving for a couple of hours and sending gravel flying – but it was a bed and shelter from the rain – which now stopped and allowed the sun out. WiFi didn’t work in the last two motels by the way. Next morning, the sky was blue again. And we had a much better day. Once again, we passed through town having a celebration – we really had to stop in this nice town of Chelsea – or as I will always think of it, Jiffytown. I’ll bet any money this woman was using her phone! So it is goodbye for now – our friends do not have internet – so we have to come into the nearest town – Gibsonburg – to use the library; sorry if there are typos and if this is quick, but have to dash. I love following your posts. Your photos are always interesting and informative. Have you had any problems with the Breva? Where have you gone for service. There are so few Moto Guzzi dealers in the US. Keep up the great pasts. Hi there. Thank you for the comments. We have our Breva Serviced in Lansing, Michigan (GT Motors). 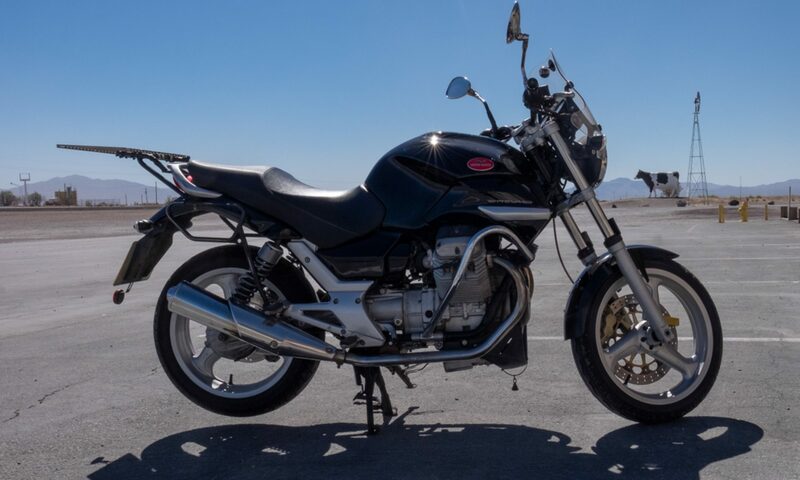 When the bike was still under warranty, we used a Guzzi dealer in St Joseph, Missouri and one in Prescott, AZ – that was to comply with the 1000 mile services etc. But Larry, in Michigan is now the person we go to – he is incredibly knowledgeable as he has been a Guzzi fan/owner all his life. Let me know if you need his phone number – I’m in the library and don’t have it with me. Glad you enjoyed the UP. Just for the record unfriendly people and republican affiliation are not synonymous. Really enjoy following your route. How comfortable are the mesh jackets during the summer and any suggestions for riding two-up that you can share after logging so many miles? My wife and i are about to take our first short trip on our Breva 750? The mesh jackets (made by Firstgear) have been fantastic – but well past their best now. We wore them riding through Death Valley and in Kansas, last year, we had 125 F so we were really glad we didn’t have anything heavier on – but in that heat, nothing helps and I felt quite ill with heat stroke. Other than that, all I can say is the Breva has coped well with the two of us and all our gear – tent and camping gear, first aid, tools, cameras, computer, clothes and lots of odds and sods – maps etc. The original side bags suffered on our first trip – one of the bolts worked loose on the frame, the bag dropped onto the exhaust pipe and we didn’t realise until we saw the smoke and flames. Also, they are a pain to remove – you have to unlock them from the inside – so I would recommend a set of bags that fit across the seat and do not rely on the frames; alternatively, you could customise the frame. We would dearly love to be able to do that and fit metal sidebags like you see on the Beamers, but, because we store the bike in Canada, we never have the time or opportunity to do that sort of thing. The bags we use at the moment cost $169 about 4 years back and have had a couple of fixes to strengthen them.